The Seasons - While the distance between the earth and sun changes throughout the year it is not this change in distance that causes the seasons. In fact, earth is closer to the sun in January. 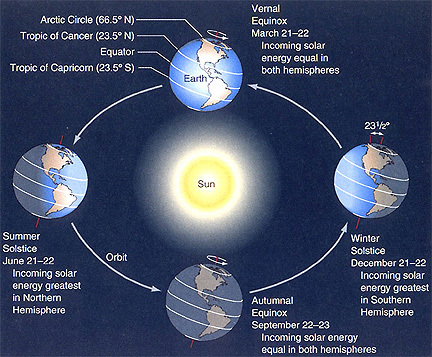 The reason for the seasons is that earth's axis is tilted 23.5 degrees which means part of the year the Northern Hemisphere is tilted toward the sun = our summer and part of the year we are tilted away from the sun = our winter. 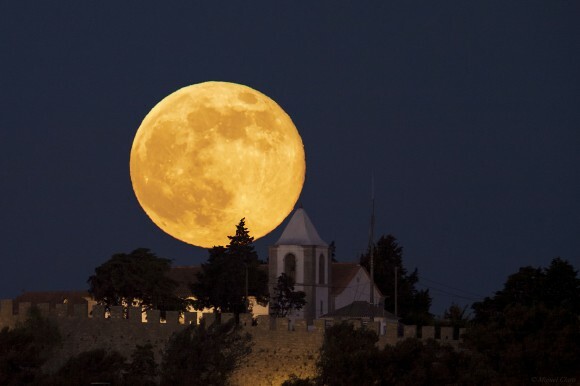 The Moon - Is earth's nearest companion and in astronomical terms is very close to us at 240,000 miles. It's diameter is one fouth of the earth's diameter which make the tennis ball, basketball comparison of the moon and earth a good approximation of their respective sizes. The moon is tide-locked with the earth which means it always shows us the same face as it orbits the earth.